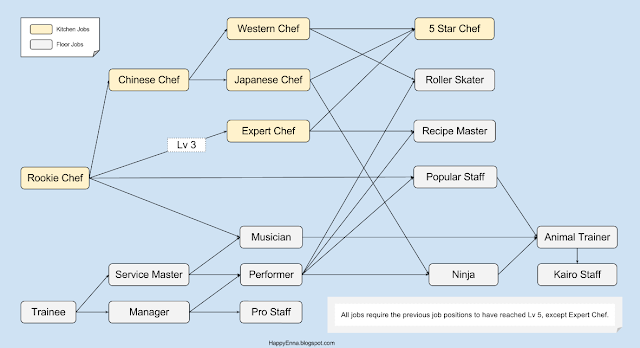 I thought it's probably easier to understand how the jobs linked together in Cafe Nippon ( Cafeteria Nipponica ) using a graph, so I made this one. It was my first time using Google Drawing. What do you think? 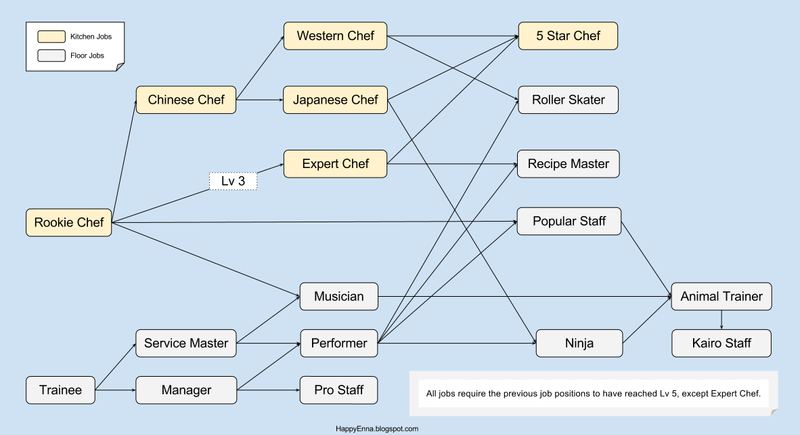 I will add this graph to the job list post. Click the picture to view it in its original size. =O *blush* Thank you, GrYnder. =D Let me know if there's anything I can do to help. Have fun! I am! My early years on this weren't so good 'cause I couldn't really figure out why my sales were so bad, but now I think I'm getting on track now. Gotta focusfire on one dish! :p Get those micro stats up! Would you recommend moving to the more popular locations asap, or should I stick around at some of the earlier ones first? We start from A, when we have enough stuff and money, we'd get a second store in B. Then another store in C.
I stick around until I'm happy with the rank and items I get from ingredient search. Then I move A to E, B to D. That's just me though. It really depends on your $ situation. You don't want to move too fast and not being able to afford to go ingredient search. Honestly haven't had much time for games for the past little while... :( Sad times, I know. Mostly been playing mobile games during my commute, but occasionally I'll get on my PC and play Counter-Strike or something.